A man returns home and tells his pregnant wife he’s leaving her, with the police unable to find the murder weapon. Watching the Dead Weight (1959) episode of Alfred Hitchcock Presents (1955-62), this story immediately whetted my appetite for more of this TV suspense series. Reading through the series episodes’ storylines, a crime of passion tale named Lamb to the Slaughter (1958) had all the right ingredients. The episode stars one of Hitchcock’s most popular leading ladies in this series, Barbara Bel Geddes. This actress now known – to my generation – as Miss Ellie (Ewing Farlow) in TV’s Dallas (1978-91). In addition, both the story and screenplay were written by Roald Dahl. Dahl, was an author best remembered for writing the Bond film, You Only Live Twice (1967) and penning those children’s books including Matilda and Charlie and the Chocolate Factory. The icing on the cake, this particular Alfred Hitchcock Presents episode was directed by the Master of Suspense himself, Alfred Hitchcock. This leading lady’s links to the Master of Suspense appear to go back to 1937. Back then, her father industrial designer, Norman Bel Geddes and Alfred Hitchcock and his wife Alma attended the Dead End (1937) premiere. Her father accompanying the leading lady Sylvia Sidney to this event. Norman Bel Geddes also the co-writer of this 1936 play of the same name, and the set designer for this movie. 20 years later, Hitchcock met Barbara Bel Geddes, Norman’s daughter for lunch. There he offered her a leading role in his TV series, Alfred Hitchcock Presents. This for this episode, and the leading role of pregnant Mary Malone. This one of Hitchcock and Bel Geddes four collaborations for this series. She also starred in Sybilla (1960), The Morning of the Bride (1959) and The Foghorn (1958). With this actress speaking fondly of this “wonderful” director after he directed her in the movie Vertigo (1958). The story begins as young Mary Maloney (Bel Geddes) waits for her police chief husband, Patrick (Allan Lane) to come home from work. The Maloneys are expected at a friends for drinks later that evening. Patrick returns home to his devoted wife and soon to be mother of his child. She seems very much in love calling him darling at every opportunity and seems happy in her lot. Philip seems distracted, Mary feels he’s tired and offers to cancel their visit. She’s doing all the talking as he goes to pour himself a drink. It’s then that Patrick drops his bombshell. He’s leaving her and his unborn baby. Patrick tells her unemotionally that he has met someone else, they love each other and want to marry. Mary appears stunned and appears to deny to herself this happening. As if in shock Mary goes to the kitchen, then to the cellar to prepare dinner. She slowly opens the freezer taking out a frozen leg of lamb. It’s a huge joint and shaped like a baseball bat. She unwraps it slowly and carefully. In the living room, Patrick is distracted as he fixes a drink. He pours himself a whisky. Mary impulsively hits Patrick on the back of his head with the frozen lamb leg. He falls motionless to the ground. Dead. She calmly and deliberately puts the oven on, and puts the lamb in the oven. Mary phones her friend to cancel, and ponders her next move. Calmly, she messes up the room with upturned chairs and tables. Leaving the room in disarray. She dresses then purchases some vegetables from the local shop. She appears animated and carefree as she talks to the shop owner. Returning home, Mary notes Patrick is dead. Then she calls the police.. The police visit, and they appear to be colleagues of Patrick’s. Mary appears upset and tells them that found her husband dead on her return home from the shops. As Lieutenant Jack Noonan (Harold J Stone) questions the police headed by try to find finger prints and a murder weapon, which they believe is shaped like a club. The police suspect that the perpetrator attacked Patrick when he least expected it by someone he knew. Noting no soda was added to his whisky as whisky and soda known as his drink of choice. This was a wonderful episode with Hitchcock using the well written script, perfect casting and stirring music to make a memorable episode. From her initial appearance, Bel Geddes appeared quite a docile, placid wife from those early scenes. She listened intently to her husband, showing no upset as he told her of his affair. Seemingly in shock after he announced his news. It was interesting to see her anger and distress only appearing as she hit her husband with the lamb leg. This act showing her hidden feelings. But more shocking was her lack of fear or any other emotion after this incident. Showing her lack of remorse and feeling. she placed the lamb in the oven. These traits still apparent as she recounted her alibi and version of events to the police chief and his colleagues who visited. These events showed a chilling and eerie side to her character, with the police appearing to trust this woman with her calm and genial facade. I’ve always loved Dahl’s twist in the tale stories. I was an avid fan of these stories as filmed for TV in his Tales of the Unexpected series. This author often remembered for his black humour with a touch of horror. His macabre but humorous style of writing perfectly portrayed in this episode. Suspense and apprehension felt as the police correctly deduced events prior to the murder. Yet as the camera pans to Bel Geddes these appear not to unnerve this cool, calm and collected perpetrator. These scenes however, with Bel Geddes remaining calm and placid with no signs of distress make you wonder just how long it will be before the truth is unraveled. Bel Geddes is fantastic casting with and this role a shocking one compared to those wonderful mumsy and homely adverts she made in the eighties. Here she promoted “home cookin” with a vat of tinned soup. Also in her Dallas role as Miss Ellie, as the Ewing matriarch she often gave support to a Ewing in the Southfork kitchen. These character traits now seem quite tongue in cheek, knowing the plot of this episode. And this episode in showing, a complete contrast to these placid and sweet performances. However, her role here may explain why many people felt that Bel Geddes had a darker side to her acting. With many believing Miss Ellie had hidden traits. and was the one who pulled the trigger in that Who Shot JR? cliffhanger back in 1980. This one of only 17 episodes of the series as directed by Hitchcock, and one that surprisingly wasn’t updated in the New Alfred Hitchcock Presents series in the 1980s. This despite this episode’s popularity with it placed at number 59 in the TV Guide’s 100 Best Episodes chart. The new series boasted many a great mid-1980s acting talent – such as Karen Allen, Ned Beatty, Barbara Hershey and Mark Hamill – updated many of the stories from this earlier series. But with a new director and in colour. However Lamb to the Slaughter was later adapted for Dahl’s Tales of the Unexpected (1979-88) series. With a new ending and starring Susan George and Brian Blessed. Perhaps if this plot filmed again with a Hitchcockian director, the title updated to that quote from Star Trek‘s Khaaaaaaaaaan, “Revenge is a dish served cold”. 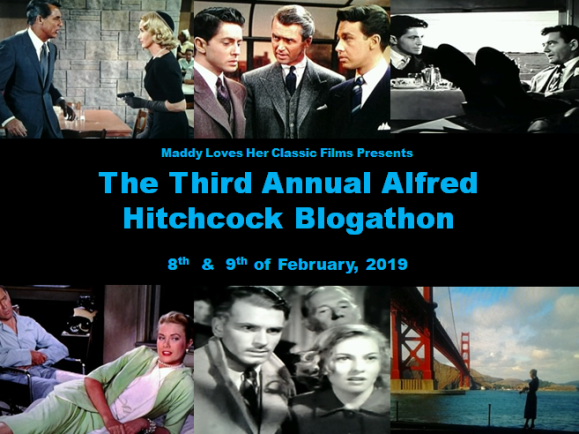 This review was added to For Maddy Loves Her Classic Films 3rd Annual Alfred Hitchcock Blogathon. Other reviews with this cast include Hitchcock in the Suspicion Episode of Four O’Clock. This series also reviewed n the episode, Dead Weight. Hitchcock was written about in relation to his biopic Hitchcock. Barbara Bel Geddes stars in my review of Prime Time Soap Star Ads and in my Dallas review. She also was featured in posts submitted for my Darlin Dallasers blogathon. Roald Dahl was also a co-writer for the Chitty Chitty Bang Bang and wrote Willy Wonka and the Chocolate Factory. It is, you can tell Barbara Bel Geddes enjoyed making it. This is one of my favourite Roald Dahl short stories, so I’ll be sure to try and find this episode. I really enjoyed how you spoke about Hitchcock’s approach to the story and the main character’s duality. Thanks, its a great episode. I loved seeing this one as had only seen Bel Geddes in Dallas, so it was quite fun seeing her in another role. It’s such a good episode. Love THAT ending. Glad you enjoyed it and hope you get to see more episodes from this series. Thanks for joining me Gill. Thanks Maddy, was a great find. And thanks for being so good with all those changes! Terrific review of a classic television episode. I always find writing about episodic television a challenge and you carried it off with ease. I think the producers of the updated series must have looked at this genuine classic and rightly assumed that they couldn’t do any better. PS: Whenever I take a piece of meat out of the freezer to thaw my hubby goes into an act complete with cowering and begging for his life. Hitchcock is influential in more ways than he imagined. Thanks for the lovely comment Paddy, I’m getting seriously hooked on those old suspense series now. And love that story about your husband..